Speaker: Damien Hirst: the dollars and sense? Great thing to go and see Graham. Is it worth posting a link to the Tate Page? There's a video too. Speaking of amazing exhibitions, when I saw the title 'Degas to Dali' advertised at the Auckland City Gallery I thought, 'yeah, probably seen all those'. Nope. One of the best collections of international art I've seen on a New Zealand Gallery's walls. If only to see things like Dali's Raphaelesque Head Exploding and a full sized Lichtenstein, among many others, you should go. I'll be going again for sure. Eh, art as commodity at it's most blatant is hardly fair. After all, if you buy a Hirst you get an actual thing. And the exhaustion of ideas? Well, if you say so, but I reckon that the Physical Impossibility is a pretty sweet idea. I know little about Damian Hirst but I remember recently seeing a Come Dine With Me UK programme, where all the guests bar one were quite posh. One of the hostesses had a Damian Hirst, who she fully expected the resident Pleb Guest not to have heard of. Since he was a plumber and all. He had. Although, I guess when you think about it the sale of The Scream for $119.9m (£74m) to a private collector, who will probably put it in their bedroom, never to be seen again, seems to speak to the same problem. Wouldn’t want it in my house, FWIW. I guess when you think about it the sale of The Scream for $119.9m (£74m) to a private collector, who will probably put it in their bedroom, never to be seen again, seems to speak to the same problem. I’m not a fan of Hirst, I think his work is shallow and trivial. But I admire his chutzpah. I think Hirst will be remembered for making money rather than for being creative...it’d be nice if the two weren’t mutually exclusive! I'm interested that the skull is impressive in the...flesh, though, Graham. Currently, Christchurch has a reasonably good contemporary art programme. The Rolling Maul thing at CAG's place on Madras is probably one of the more exciting contemporary programmes in NZ at the moment (go see it actually, Zina's show is pretty nice), and Jonathan Smart has had a pretty respectable series of shows, with a Saskia Leek show opening this Tuesday. Have just looked that up. Opposite the end of Ash St? And Jonathan Smart's now in Linwood? Man, it’d be nice to have an art gallery to go to…. Yeah, the NG building. Smart’s in Neil Dawson’s studio these days, something or other England Street Linwood, and the Physics Room is in Sandyford Street, although they have got back into the old Tuam Street building and are renovating it. Thanks. Love that Back Burn painting, wish I had known about the Simon Edwards exhibition -- I see it finished today. +1 Looks like a stunning series. Great review thanks Graham. 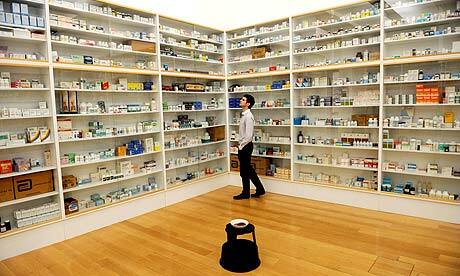 The two best attributes about Hirst's practice are honesty and accessibility; the detrimental attribute, pure ambition. His admiration of the painter, Francis Bacon, is the best lens through which to consider Hirst's work. Gordon Burn's 'On the Way To Work' http://bit.ly/JVEmD7 is an insightful, entertaining read and clearly follows, as a template, David Sylvester's earlier 'Interviews With Francis Bacon'. Understanding Hirst's adoration of Bacon, his lens for understanding the genealogy of western art historical narratives becomes apparent as do his aesthetic successes, failures and ultimately his understanding of the class system. I agree though that his work is patchy, as for chutzpah he speaks to a generation for whom chutzpah has become currency. Sometimes I long for the days when galleries where quiet, inhabited by snooties students and some others. The thing with fine art that tries to compete with popular culture is that pop culture always does it better, bigger and more widely. What’s the point of art that’s no more creative than a soft-drink commercial? Why bother? It Hirst hadn’t pulled off this trick of selling his work for vast sums, I doubt anybody would take any notice of it. That's not true though -- Warhol, Hirst, a few other artists are brands as big as anything. Certainly I suspect Hirst or Emin are as well known brands in the UK as many television shows or bands. That’s not true though – Warhol, Hirst, a few other artists are brands as big as anything. What I was saying is that there’s limited point to art if it’s not creative work. What Warhol did was creative, at least at first. But beyond that, pop art is either irrelevant or it’s a kind of confidence trick. And Hirst gets top dollar because he’s made himself notorious. Just because he’s a celebrity doesn’t make his art worthwhile. IMHO. It Hirst hadn’t pulled off this trick of selling his work for vast sums, I doubt anybody would take any notice of it. FWIW. Damien Hirst and I share roughly the same age bracket and many common cultural threads. I first saw Hirst's work in 1992 at the Turner prize preview; at the time, I was unaware of the hype that surrounded the work. After that I went regularly to London to catch up at the White Cube and went out of my way to follow up on what I had seen. In 1997 I bought a first edition of ” I Want to Spend the Rest of My Life Everywhere, ………. “ (I wish I had bought two). I’m pretty sure that no one made any money from that book at the time (but that might have been part of it). Indeed it cost barely twice the price of certain exhibition catalogues of the era. I didn’t get excited about Hirst again, until For the Love of God which grabbed me without seeing it for real. I am for my own part a denizen of the first proper British consumer generation. My sensibilities were tuned by 24hr TV, MTV and a high period for television advertising that culminated in Tony Kayes’s tested for the unexpected Dunlop advert (also 1992/93) and Guinness’s “not everything in black and white makes sense”. In print I got to see ads that mixed art and product in many ways. For a while, adverts were concentrated culturally referent devices. I’ve always assumed that Hirst saw that too. It certainly seemed that way when I saw “pharmacy” and “the impossibility”. I disagree with Greer in so far as Hirst’s work isn’t just about the money/sale and the theatre surrounding it. The contemporary reference is part of the work and I wonder about how folks in the 70’s must have seen the work of Warhol. Like it or not Hirst owes to Kandinsky, Pollock, Duchamp, Hopper, Bacon, Freud and Warhol amongst others, drawing from a palette of my time. Anticipating the dilemmas of a modern internet age, Hirst smears homage, plagiarism, craftsmanship and greed in unexpectedly concentrated ways. For me the works function on many levels through the references they make even after twenty years. This is a deeper art in its own right, and one that I suspect will be treated kindly in parts, if not entirely, by future generations. 81st sidesteps quietly towards the door.. Thanks 81st, I appreciate your well-reasoned perspective. It would appear that while Hirst may be/have been an artist he cannot paint.